Great things await us in 2016, at least in the realm of Moodle! Here are some updates on new features you may want to put to use next semester. 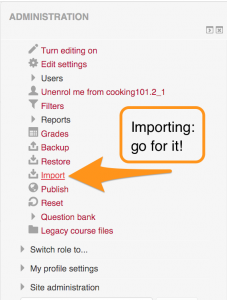 Faculty can now import materials from one course to another without getting an error message! Yeah! Here’s how. We’re still happy to do it for you, too, just let us know. Using our new “set default home” feature in the log in block will save you a few clicks each time you log in. 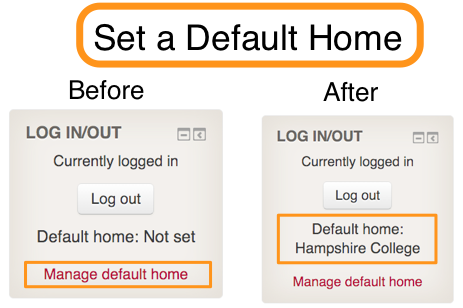 Setting a default home makes Moodle remember that you are from Hampshire, and will take you right to the Hampshire log in screen instead of first having to choose Hampshire from a list. Just think of all the time you will save! Where am I? What day is it? Now you can find out, thanks to Moodle! 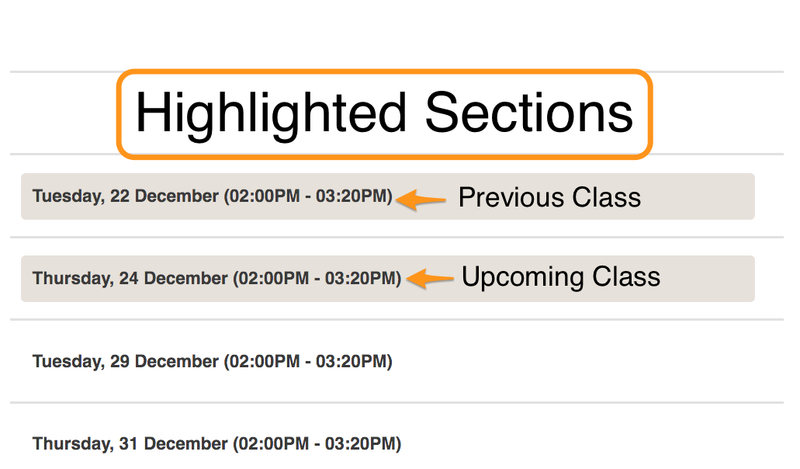 In courses using the default class-by-date format, Moodle will now automatically highlight (in beige) the sections nearest to the current date. This way you can see at a glance where you are in the course and in the semester. This particular feature was developed by our student web programmer, Andy Zito, and lays the ground work for further improvements to our Moodle formats! Thanks Andy!!! Is the “scroll-of-death” in Moodle driving you crazy? The new-ish collapsed topic format makes your course more navigable. You can even use it in combination with individual dates for each class meeting. Find out more about it here. Many thanks to our new web programmer Kevin Williarty who joined us in 2015 and made many of these improvements possible. Also big thanks to our student web programmer Andy!! As always if you need Moodle help or have any questions please email moodle@hampshire.edu. A group of faculty met on September 20th, 2013 in the Center for Teaching and Learning to discuss Moodle. Natalie Arnold of IA and Jason Tor of NS showed their moodle sites and strategies with the group. Here are some highlights and tips from the discussion. Moodle is helpful for keeping the class organized, especially when it comes to group projects and making sure each group knows what it is doing when. Giving TA’s editing access to Moodle and letting them help set up the site can be great, as they are “less scared”. Since the Moodle site can become very looong, Natalie puts information pertaining to the final project at the very top instead of the very bottom. Readings can be assigned to groups within a class- either by just stating on the site “this article is for group x” or you can set Moodle to limit access to a resource to a group of students. Natalie found that putting information “one click down”- ie on a sub-page or within an assignment- became problematic because students wouldn’t always click a link and were missing information. She started putting all important info right on the main page. She found that lots of repetition was also important in making sure students didn’t miss important information, especially in tutorials. Jason used the “Questionnaire” feature to poll the students at the beginning of the term about their current knowledge and interest levels, goals for the class, etc. Quickmail versus News Forum: The News Forum is a one-way forum which the instructor can post to, and posts go out as emails to the whole class. Students cannot post or respond to the news forum. The news forum no longer appears by default in new course websites, but it can be added in by adding in the “Latest News” block. Quickmail basically does the same thing so IT recommends people just use that. For those that don’t want or care about the Course Information block: you can click the little eyeball appearing to the top right of the block when editing is turned on. This hides it from everyone, including the students. Minimizing or docking the block only affects an individuals view. Discussion of reports in Moodle. You can view a student’s activity report, but please bear in mind that it is not 100% accurate. Depending on how a resource is set up, Moodle may not know whether a student clicked it or not. Files, for example, default to “force download”- which is far better usability-wise but does prevent Moodle from registering if a student clicked a link. That said, even if a student downloaded a reading that’s no guarantee that they read it! General questions about tracking student work in assignments and forums. Both can be set up to use Moodle’s “grading” feature to allow the instructor to keep track of who’s submitted what. Question of how to have students build portfolios from semester’s work and then submit on Moodle. There’s not a great automated way to do this but students can compile their work as a single PDF or similar and submit as assignment. Natalie used forums and had them as a required class activity. Students had to post and also had to post a reply to someone else. She found that having a discussion forum changed the class dynamic in a positive way in that students were more comfortable in class after interacting online. Jason required students to post a question about the week’s reading to forum. This made it very apparent who had done the reading and who had not. He had students attempt to answer each other’s questions, he also addressed them in class. He generally only chimed in on the forum when a student gave a wrong answer to a question. The class worked in groups on problem-based case studies and reported out during class on their findings. Jason took more of a guide-on-the-side role, never lectured, and simply floated around class answering questions the various working groups had. There was no way to not participate in class. Also, it would quickly become apparent when students didn’t prepare or do reading since there was no way to fly under the radar. General discussion of how this kind of learning experience builds greater retention of material and really stays with the students. We plan on offering similar sessions in the future so stay tuned or check out the Center for Teaching & Learning Program Calendar here. Most Fall 2013 Moodle sites are now available in Moodle. After logging in you’ll see them listed under “Future Courses”. If you had a Moodle site for a previous version of your course, email moodle@hampshire.edu and we can import the content over for you into the new site. Want to get some ideas for your Fall courses? 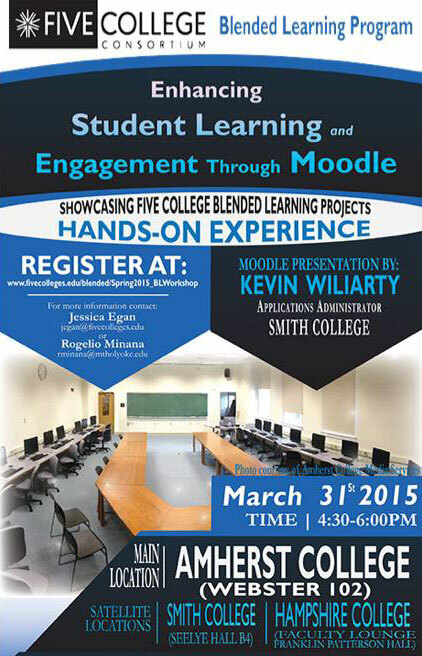 We’re running a series of demonstrations of Moodle features that other faculty have used with success. 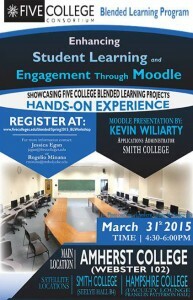 Here’s a recap of last week’s Moodle lunch for faculty. John Slepian of IA kindly agreed to show us how he uses Moodle. He also teaches at Smith, so had used it for a few years there, even before Hampshire adopted it. John spoke about using to organize the schedule for the semester- he outlines the topics and sections for the semester and then plugs in appropriate readings, media, etc.